“Intuitively, it makes sense that some forces must act to compact the spheroids: any change in shape requires a force to make that happen. However, realizing that relatively small levels of tension in the ’skin’ are sufficient to balance large compressive loads within the tissue was quite surprising, and demonstrated how coordinated activity of relatively weak cells can give rise to large effects”, says Prof. Moraes, who is also the Canada Research Chair in Advanced Cellular Microenvironments. 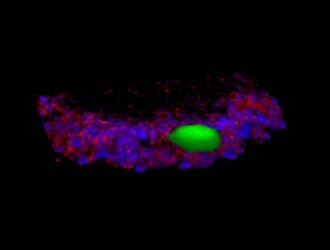 Image caption: In this photo, a flexible sphere (green) is deformed by forces generated by cells within a tissue section (cell nuclei are stained in blue and cytoskeletal actin in red). “Dispersible hydrogel force sensors reveal patterns of solid mechanical stress in multicellular spheroid cultures” by Wontae Lee et al. was published online on January 11 in Nature Communications.